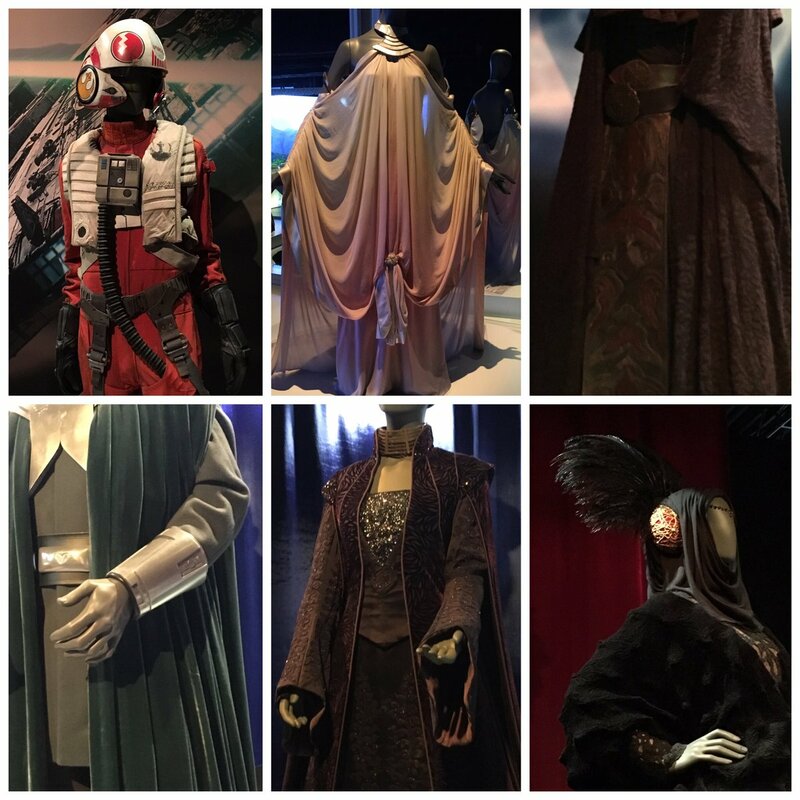 The Smithsonian’s Star Wars and the Power of Costume Exhibition is beautifully done and the only thing that could possibly make it better would be for even more costumes to be included. At 60 costumes though, this exhibit is nothing to sneeze at especially when it comes screen worn costumes from all three trilogies. The Prequel Trilogy has the heaviest presence but that makes perfect sense given how many costume changes Padmé alone had in just one film. They feature an impressive portion of her wardrobe. By some miracle, I managed not to cry while looking at the dresses although it was pretty touch and go for a while after I saw the Lake Gown for the first time and then walked into the room with her funeral dress at the very end. (The funeral gown, by the way, is one of the most beautifully presented things I have ever seen in my life.) I also may have had to sit down on my heels in front of the blue Tatooine dress and just contemplate my life for a few minutes. I also only set off one of the alarms once and the lady keeping an eye on things reassured me that the sensor was just finicky. Point is… I behaved. Mostly. As much as I could have. 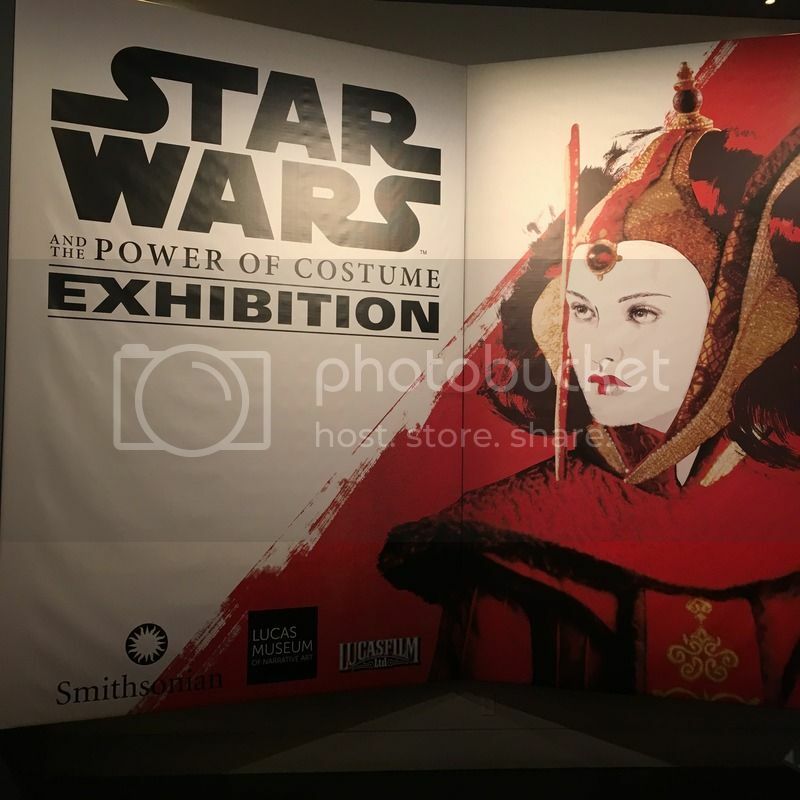 Being a metaphorical student of both fashion and costumes, I’ve spent many hours staring at high resolution images of a lot of these costumes especially the ones belonging to Amidala and her handmaidens. Cameras can’t catch everything though. Up until Saturday, I had no idea that the button details on the sleeves of the sage green Handmaiden dresses even existed. I assumed those were just continuous pieces of fabric. Luminara Unduli is another costume that really benefits from getting an up close look. The textures of the fabric is absolutely incredible. Crazily enough, there were actually a few samples of the fabrics available for people to touch! All of this really just goes to show how much care, work, and effort, Trisha Biggar put into each and every one of the costumes she created for the Prequels. I’m not sure which was my favorite costume to see in person. The Lake Dress is certainly a strong contender since it’s my favorite of all Padmé’s gowns but it also didn’t quite kick that sense of awe into me quite as much as a few others. The Wedding Dress certainly made me contemplate my life for a little while because THAT FREAKING ANTIQUE LACE THAT’S IMPOSSIBLE TO RECREATE. It’s one of those dress’s that even more drop dead gorgeous in person. Maybe it was the Green Velvet with all the beautiful textures? Or the Handmaiden gowns were certainly incredible to finally see after being a fangirl of them since 1999. 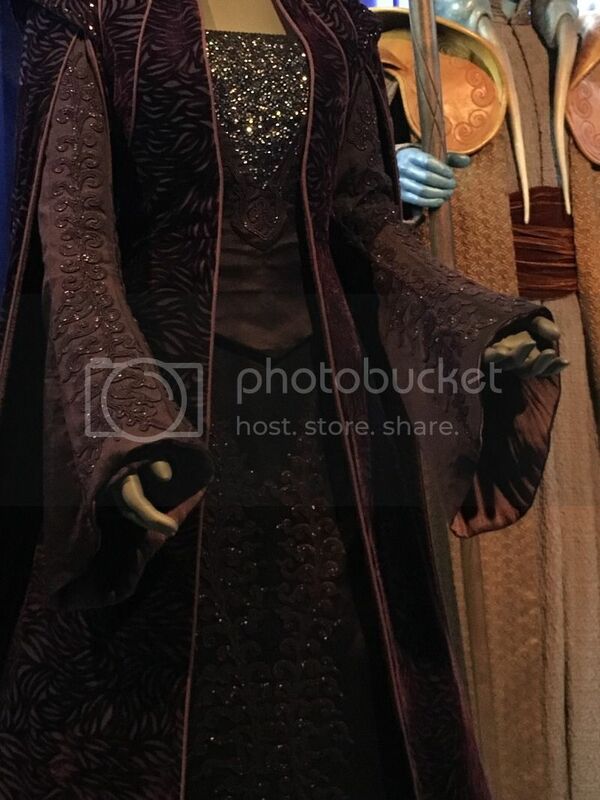 No, I think it was the Purple Senate Dress because not only did walking into that room make me feel like I was on Coruscant for a moment but the level of detail and the amount of work just floored me… literally. Visiting the exhibition was an incredibly opportunity that I recommend to everyone on the face of the planet. Very few things in this world can leave me feeling so emotionally overwhelmed but this exhibit was absolutely one of them. The hours I spent there were a magical experience that I won’t be forgetting any time ever.